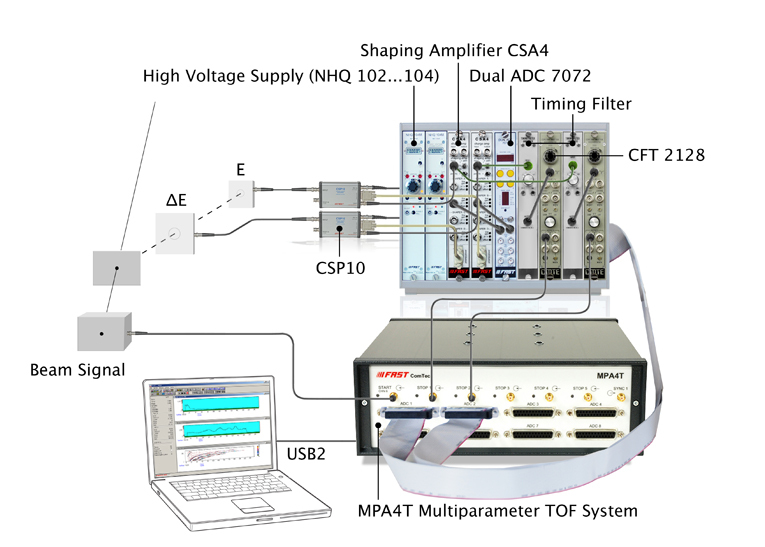 The MPA4 is a Multiparameter Data Acquisition System (4 or 8 channels). 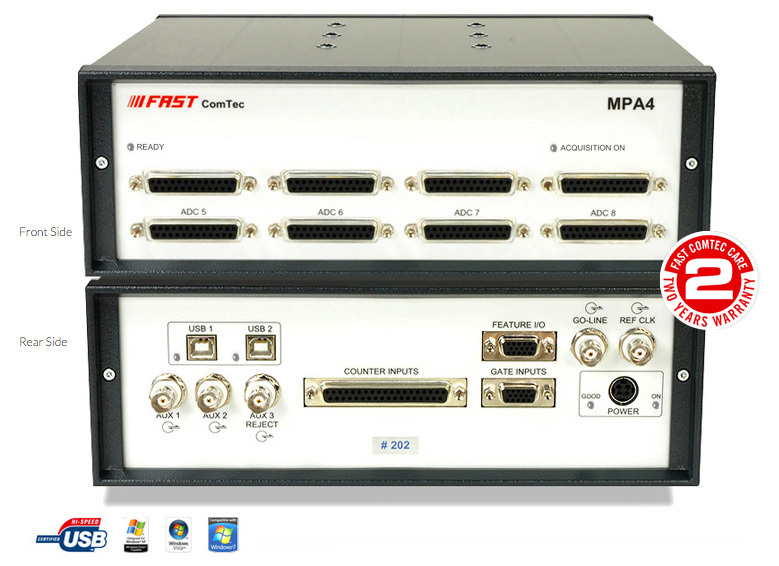 The MPA4 Multiparameter System is designed as an ultra fast list mode system with input ports for 4 or 8 ADCs, multiscalers or time-of-flight devices. 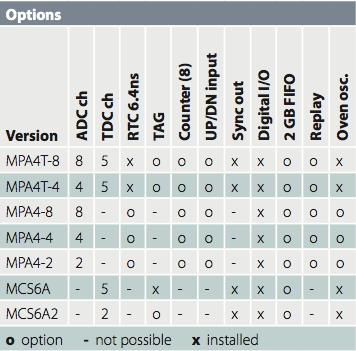 16-bit Ports can be combined to 32- or even 64-bit ports. For dependent single- and multiparameter acquisitions coincidence resolving times from approx. 20 ns (in steps of 20ns) to more than 1.3 ms can be selected. Eight 100 MHz 32-bit scalers are optionally available. In "single mode" a 64 bit event word is inserted for each ADC. It can contain in addition to the ADC data the time in units of 6.4 ns (32 bits). This mode is very interesting also for multiparameter applications as the time for each individual ADC event is available separately. In "coincident" mode the event word has a variable length of multiples of 64 bit. It contains the ADC data of valid conversions within the coincidence time window, and may contain in addition the time of the event with 6.4 ns resolution (up to 48 bit) and counter data of up to three scalers. It is possible to select special event patterns to drop unwanted events and reduce the amount of list data. A 1 kHz timer word is inserted every millisecond. It is used for counting the real- and live time for each ADC. A Realtime preset using this timer is implemented in the hardware. The timer word can contain in addition the scaler #1 data. The MPANT for MPA4 software is a 32- and 64-bit operating program developed to run under Microsoft Windows-XP/Vista/7/8 (32 or 64 bit). It is possible to define several single- and dual parameter spectra which can be simultaneously acquired and displayed. Calculated parameters can be defined to do evaluation of position-dependent detectors or any other applications. One can accumulate single and multiparameter spectra in the RAM of the PC. Multiple windows of single and dual parameter spectra can be simultaneously displayed. List data can be stored on the local hard disk device or any other directly addressable storage device. Replay software for evaluation of list files is optionally available. The timer word can contain in addition the scaler #1 data. Coincidence data may contain the time of the event with 6.4 ns resolution (up to 48 bit, option), counter data of up to three scalers, and two signal bits from auxiliary inputs. Precise start and stop simultaneously with ADC's and external devices by use of GO-Line. Replay software for evaluation of list files optionally available.